This such a sweet and girly mani. Love it! This is really pretty. Love the base colour! It must be frustrating to have people steal your images, especially with all the work you put into it. Hi Michelle. 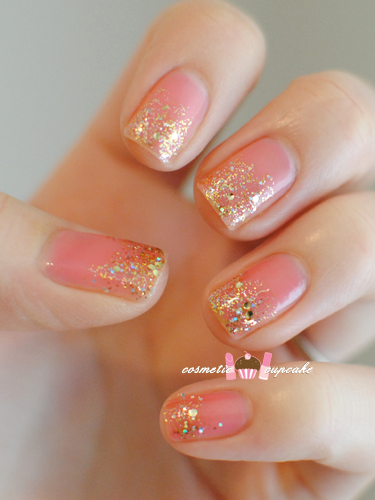 Love the pink with the gold glitter gradient. I don't mind the very prominent watermark. Sometimes you just have to do what you have to do! omg so cute i wantt o try this! 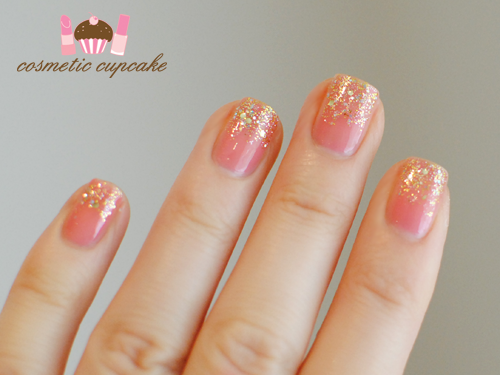 Such a sweet and girly manicure, i love it! beautiful mani ...loved it ..
Truely awesome mani! Love it! I didn't even notice the watermarks, I think they are great where you've placed them in these shots. Those stupid inspiration accounts make me so mad! very sweet mani. love the pink! i've always wanted to have a jill stuart nail polish because of the adorable packaging !!! This is so lovely! I just LOVE the pretty, sheer base color you used! I just did my first glitter gradient last night. They're so fun!